BYJ, JKS, LMH & Hallyu Star (Asian Drama - Movie) : Thailand Site...: [News] Kim Yu-na Picked as Athlete of the Month by U.S. Sports Academy. [News] Kim Yu-na Picked as Athlete of the Month by U.S. Sports Academy. 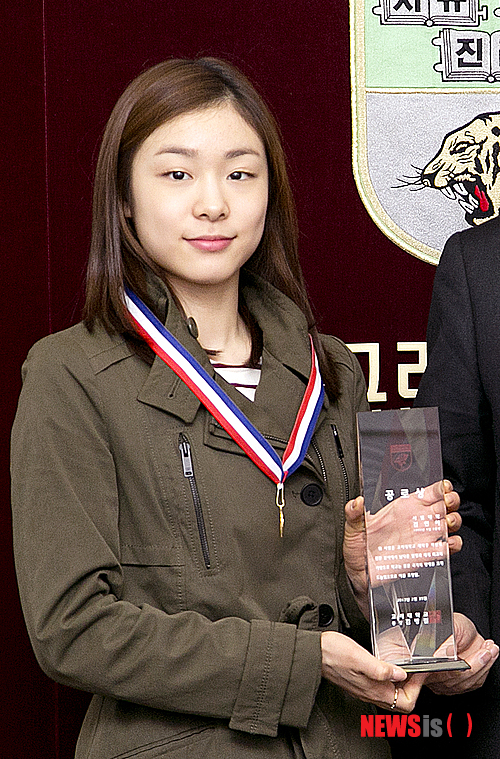 Figure skating champion Kim Yu-na has chosen as the Athlete of the Month by the United States Sports Academy based on the results of an online poll. "[Kim] returned to the world stage in figure skating after a two-year layoff. The 2010 Olympic gold medalist picked up where she left off earning the gold medal in the women's 2013 World Figure Skating Championships," the USSA wrote on its website on Tuesday. The USSA determines candidates for Athlete of the Month after receiving recommendations from journalists, sports organizations, government agencies and the public. Among male athletes, LeBron James of the Miami Heat earned the same title as he contributed to "Miami's win streak at 27 games." Tiger Woods, who reclaimed his spot as the world's No. 1 golfer "after falling from the top spot in October 2010," was runner-up in the men's category, and Jenn Suhr, who set a world record in women's indoor pole vault at the USA Track & Field Indoor National Championships in Albuquerque, New Mexico, placed second in the women's category. As Kim and James were chosen as the athletes for March, they are now candidates for Athlete of the Year. Kim was previously named the Athlete of the Year in 2010 when she won a gold medal at the Vancouver Winter Olympics. The male Athlete of the Year at the time was Spanish footballer David Villa, who performed remarkably well at the 2010 World Cup.